The Great Gorge Trail is alive with nature’s adornment after a long winter sleep. Many plants and flowers bloom to mark the beginning of spring. In celebration of Earth Day, we will identify them and talk about their many uses according to various folklore. 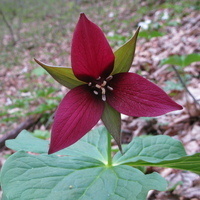 This short hike is on one of Pennsylvania’s best wildflower areas (Great Gorge Trail). Many of spring’s most beautiful citizens will be on display. Bring a camera.